This app adds support for Z-wave devices made by Logic Home Control. ZHC5010 is a new Z-Wave wall switch module with four buttons, four LEDs and contains one relay output for controlling a local load. The insert is designed to fit in to a standard LK FUGA® wall mount box (size one-module). When ZHC5010 is included, a root device and 4 sub-devices (one for each button) are created. The root device has triggers for Central Scene notifications from all the buttons. Long key press (key held). Key release, after key held. It is possible to control the 4 LED's, by means of action cards. This app and driver development has been taken over from K.T. Nielsen (owner of Logic Home Control). 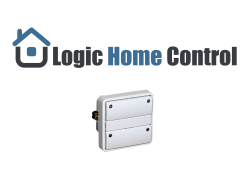 App development will be done by me but in close collaboration with Logic Home Control. If possible, please report issues and feature requests at the issues section on Github otherwise in the above mentioned topic. I have taken over the app development of the Logic Home Control app on request of K.T. Nielsen (owner of Logic Home Control) with the goal to further develop the app and add support of the other devices of Logic Home Control. Please look into the missing on/off status updates. @cbh oooooh dimming them ikea bulbs are we? Could this be done through the dimmer-state (if updated correctly) via flows? I don't think it is standard practice with the implementation of the CENTRAL_SCENE_NOTIFICATION to re-trigger. Zhc doesn't retrigger, as far as I know. It has 'held' and 'released' notifications. Although, the zhc has a multilevel association group. If I associate homey to this group, I get some sort of repeat. I don't know how multilevel works, but I'm guessing it sends up and down repeatedly. Not a numeric value. I haven't found a way to turn the LED off, except for a workaround with "Set LED flash" to values 1, 0.1, and 1 (as the LED turns off after the "sequence" of one flash in 0.1 second one time has finished). When zhc switches on it sends full brightness and off sends off. In-between you can hold to dim up/down. And it is smooth as heck. I use this to dim two PH5's holding Domitech bulbs synchronized. Is the dimmer value in the "when" column related to the leds? Isn't it a tag that can be used with dimmers by pulling it to the dimmer value of a bulb or fibaro dimmer? Oh, feature request: a "When-action" card with all virtual switches off/any switch on as action. Very usable for "lights on" warnings by the front door, etc. Feature request, the zhc's always has "light" class. Mine is used for all sorts of things, not just lights. At present, the Logichome ZHC5010 can only make multichannel associations with z-wave devices included in unsecure mode. As Homey include devices as secure if possible and the end-user cannot change this. I've e-mailed the manufacturer about this and he has informed me, that he is aware of the problem and will develop an updated firmware as fast as possible to solve this problem. Inclusion, Homey will try to include the device at the highest security level. If the device supports it, it will be added securely. If it doesn't support security, it will be added insecure. Homey does not provide an option from controller side to choose to add securely or not; therefore it is not something we can add into a app. Not all secure devices accept commands from unsecure devices; typical example are the commonly used Fibaro Dimmer-2's.... These devices don't even accept commands from their own (Fibaro) non Zwave-plus Motion sensor. The ZHC5010 is a Z-wave plus device, but does not support encryption and therefore is included unsecure within Homey. Together with owner of Logic Home Control, I'm looking for options to solve this. Adding encryption to the ZHC5010 firmware is part of the solution, but some additional changes in the device firmware are needed. I hope to be able to test this updated version of the ZHC5010 firmware soon. It does require a Z-wave USB stick (~30 euro in the NL). Logichome.dk is making new firmware - that will allow both secure and insecure inclusion according to the controllers' choice. Further, there will be a configuration parameter for setting the unit (per each logic unit) to sending either secure or unsure. Will the SDK rewrite fix the missing status updates for the virtual devices? This firmware adds the capability to include the ZHC5010 securely to Homey and some additional configuration parameters to be able to determine if a specific association group sends it's commands unsecure (secure is default)..
Just updated my ZHC5010 with this firmware; you'll love it! Also sending a Basic-SET command to a non-secure (multichannel-) node, with changing the parameter works! Feature request; Being able to turn off an LED would really make sense. Up until now i've just used "blink once" to leave the LED in an OFF-state. But when using looping flows this doesn't really make sense, since the LED will always just blink. In order to have correct status updates, multichannel encapsulation by the device needs to be enforced. To do this, follow the steps mentioned in the device note of the opening post / readme. In brief summary, when you need to add Homey's ID to one of the association groups, add it as 1.1 (instead of 1). Aaaah.... Aaaah... Thank you so much. I will try it out when I get home tomorrow. Ooh yeah. You are the man!